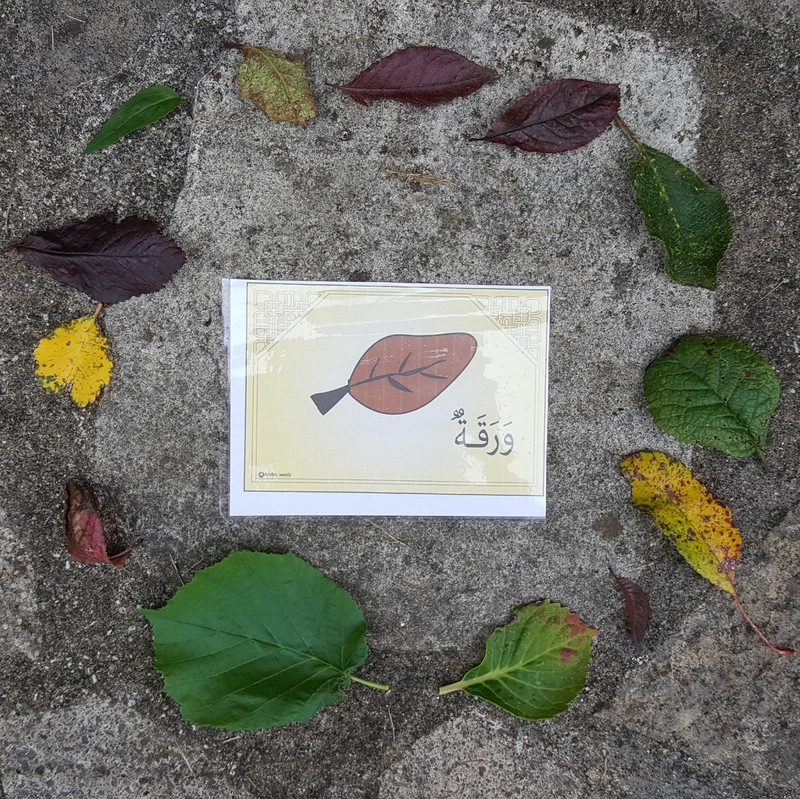 Arabic Seeds is a company that offers downloadable resources for Arabic language learning. It was set up out of the frustration of not being able to find any Arabic resources suitable for non-native speakers of Arabic. The founder wanted to show learners that it is possible to integrate Arabic into your daily life as a non-native speaker. This is why Arabic Seeds resources are based on children's interests and daily life situations. Their aim is to make Arabic a meaningful and loved language for learners everywhere. I have mentioned, in previous articles, the importance of learning to speak and understand a language before reading and writing. Arabic Seeds understand this. They believe Arabic is a language we should be using in our daily lives rather than a language we only use for reading. Therefore, they believe all four skills - reading, writing, listening and speaking - are essential for successful language learning. Although some of the resources have the English translation, some knowledge of Arabic is necessary in order to use them. You will need to know how to read Arabic as the transliteration is not given. 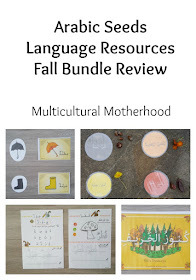 I was sent the 'Fall Themed Bundle' to review. 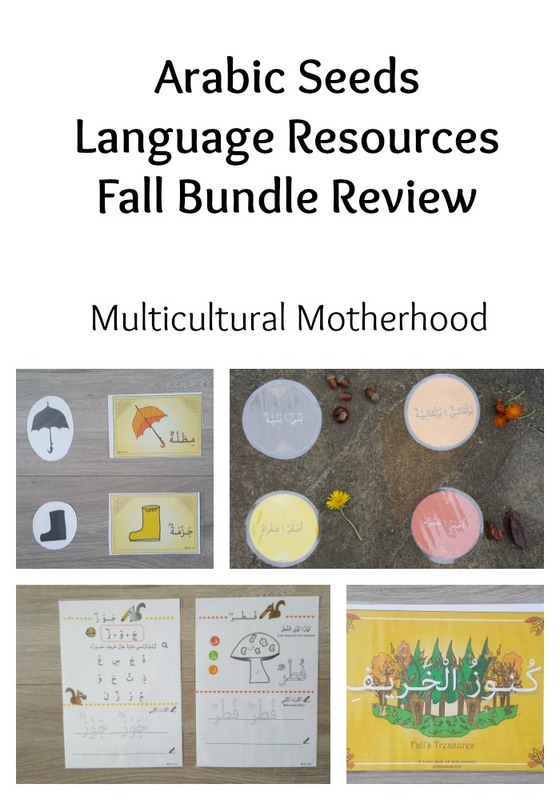 This bundle comes with a variety of fall/autumn themed resources. 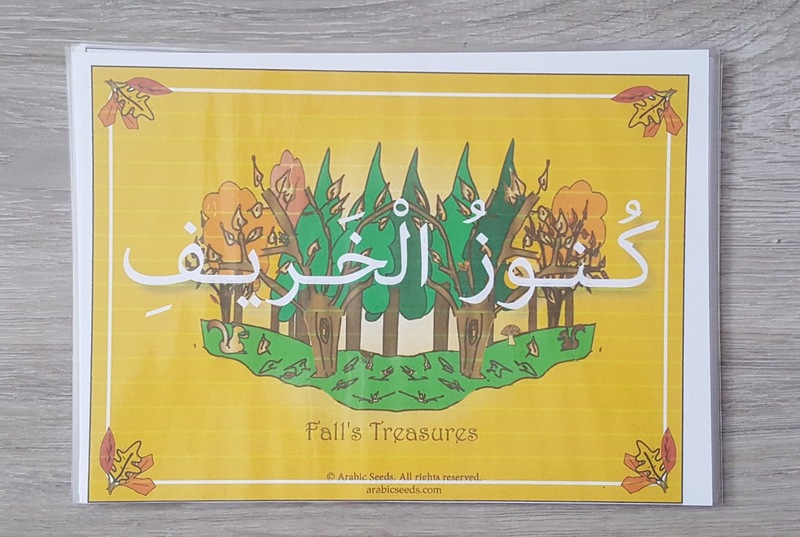 6 fall/autumn themed Arabic puzzles. 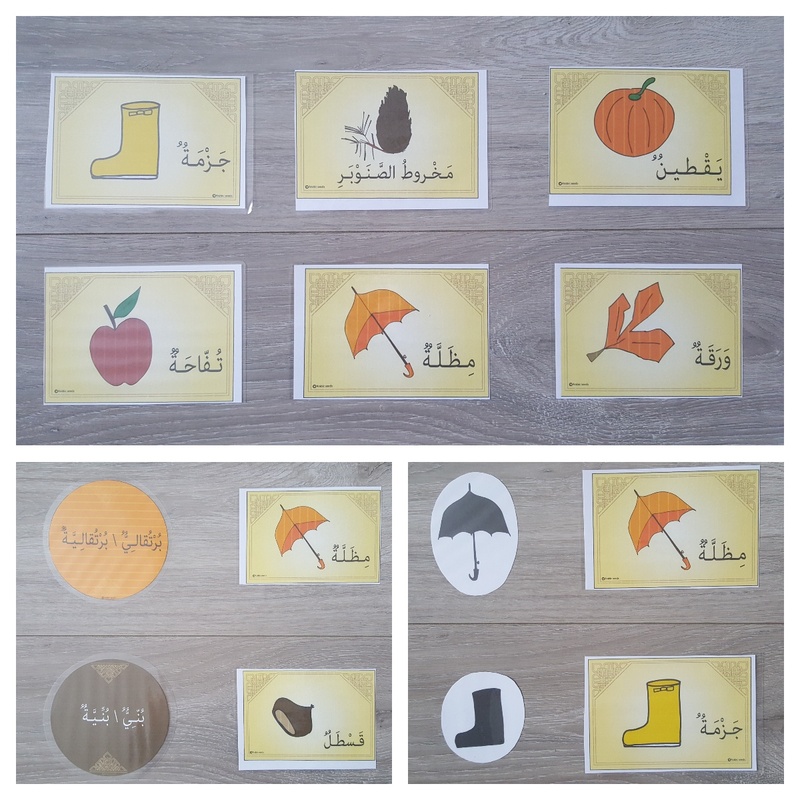 Fall/autumn flashcards - 13 noun flashcards, 13 silhouette pictures, 4 colour flashcards and a page with game suggestions. This set of worksheets comes in Arabic only or Arabic and English (both versions are included in the bundle). 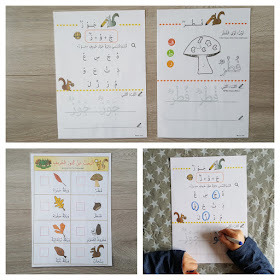 The aim of these worksheets is to practise letter recognition as well as writing. Half the worksheets practise letter recognition using a colour-by-letter method. My children love colouring so they enjoyed this. The other half of the worksheets work on circling the letters that are the same as the letters in the word. At the bottom of each worksheet are words to practise writing. First the child can practise writing over the words and then there is space to write the words freehand underneath. I laminated these worksheets after printing them out so we can use them over and over again. 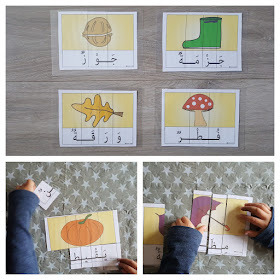 The Arabic puzzle cards can be used for reading and letter recognition practise. These can be cut up in different ways to increase the difficulty depending on your child's ability level. For younger children, cut the letter and picture into long strips (bottom right picture). The picture will help them to piece the puzzle pieces together. For older children, keep the picture intact and cut only the letters into separate pieces. Then, the children will have to use their knowledge of the word to put the letters in the correct order to form the word. 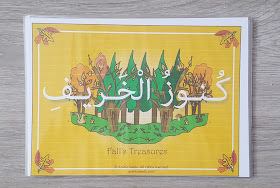 There is also a book called 'Fall's Treasures' which is a lovely book to read to your little ones. Older children can read the book themselves. The bundle comes with instructions of how to use the flashcard sets to play games. 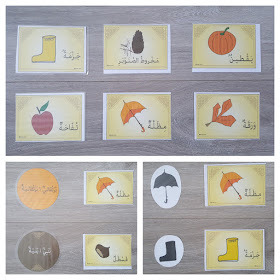 If you print off 2 sets of the Arabic flashcards or the silhouette flashcards you can play match the pairs. However, I found one sheet of paper was a bit see through so I would recommend laminating the flashcards with an extra sheet of paper underneath so you can't see what the picture is when you turn the cards upside down. If you do not have a laminator, you can stick another sheet of paper or card to the back of each flashcard using glue. Lay out all the flashcards face down on the floor and ask the children to turn over two cards at a time and see if they can find the pairs. When the children turn over each flashcard, get them to practise saying the word in Arabic. My children always love match the pair games so this was a big hit with them. This is a game that is more suited to younger children. 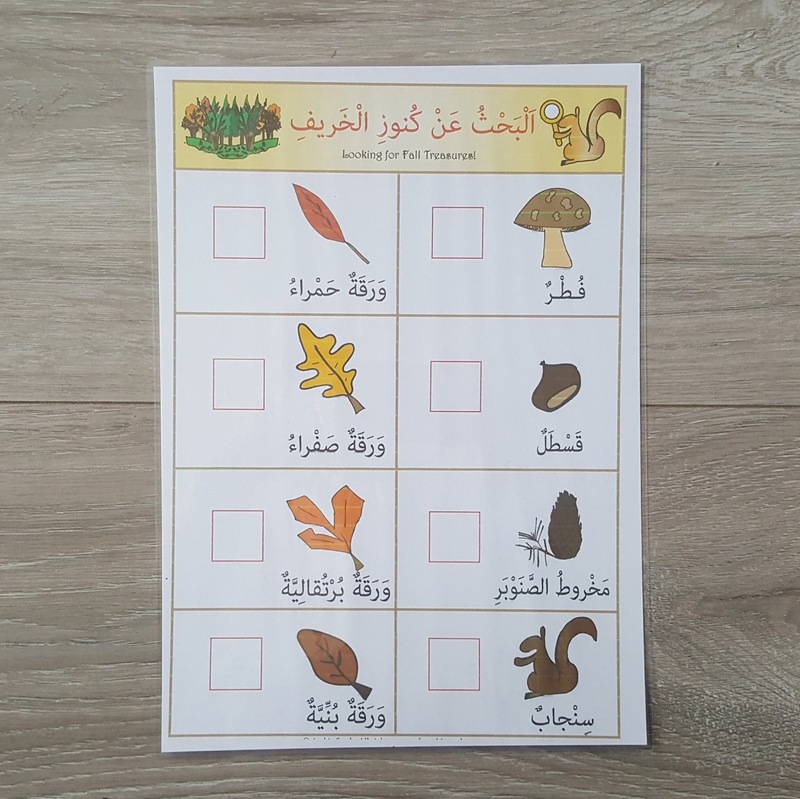 Lay the flashcards and silhouettes out in front of them and ask them to match the Arabic flashcards to the silhouette cards. My toddler had fun doing this. 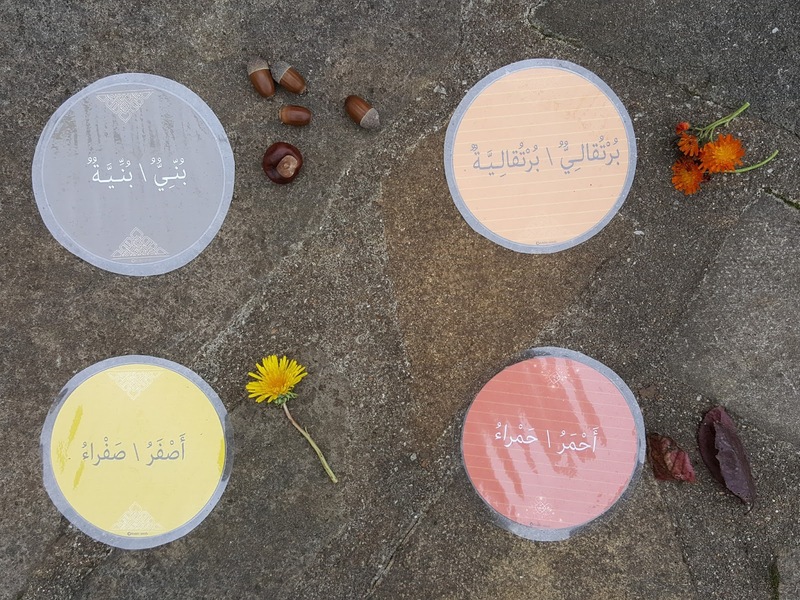 The fall bundle comes with 4 different coloured circles that are the colours of autumn; red, yellow, brown and orange. Get your children to match the flashcards to the correct coloured circles. This is a great way for them to learn the colours and use phrases, such as, 'the umbrella is orange'. 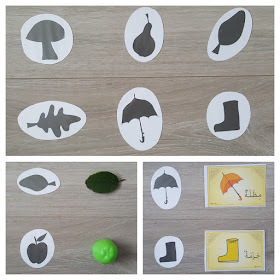 We also used the silhouette flashcards in another way; matching the cards to objects. Either give your child the objects and ask them to match them to the cards or ask them to go on a treasure hunt round the house and find the objects that match with each card. Ask them to name each object they match. 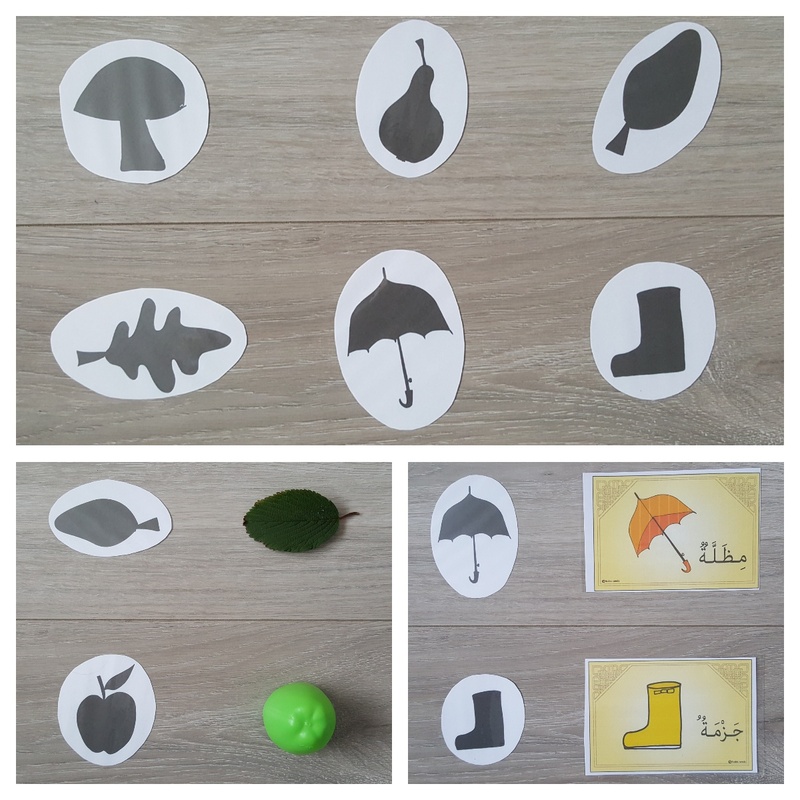 Use either the Arabic flashcards or the silhouette cards for a treasure hunt game. Hide the cards around the room and ask your child to find them. When they discover each card, ask them to name the object and/or use the object in a sentence. As these resources are nature based, they can also be used outside. 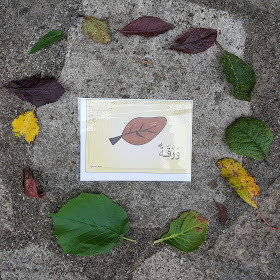 Ask the children to go around the garden or park and find objects to match with the flashcards. Ask the children to go around the garden or park and find objects the same colour as each coloured circle and match them up. Although this is a fall/autumn themed resource pack, it would have been great to have a green coloured circle too as there are still many green objects to be seen outside at this time of year. There is also this great fall/autumn checklist which you can take with you on a nature walk and check off everything you spot. 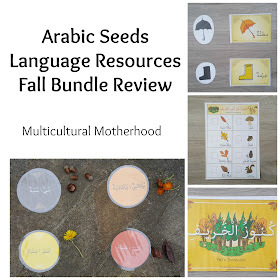 This bundle is for sale on the Arabic Seeds website for $10 which I think is a great price for so many resources. As these resources are downloadable, it does mean there is a bit of extra work for you in terms of printing, laminating and cutting. However, I am sure these resources would be much more expensive if they were available to purchase as a physical product. 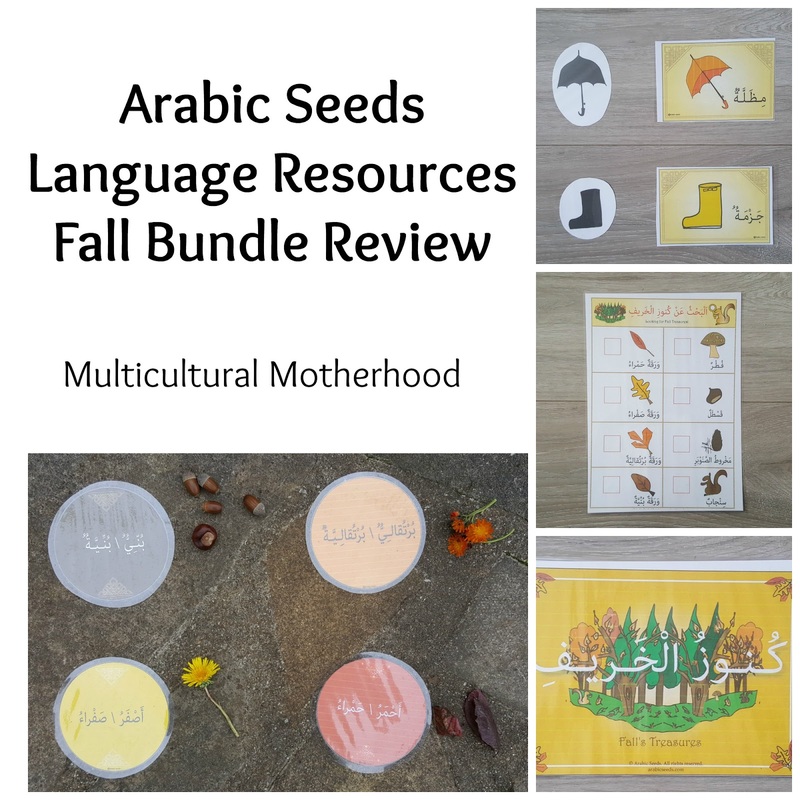 Not only have we been using the fall bundle, we have also been using some of the other resources from Arabic Seeds too. As we follow a nature curriculum in our homeschool, I have found the nature/park bundle a particularly useful resource pack. 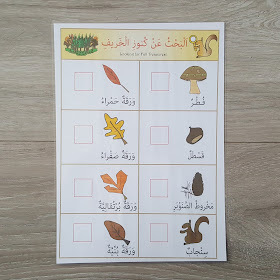 I would recommend Arabic Seeds resources to anyone whose children are learning the Arabic language. Voucher code for 20% off! Arabic Seeds have kindly offered a voucher code for an incredible 20% off on all downloadable resources from their website https://arabicseeds.com/en/shop/. Use the code livelovearabic at the checkout for 20% off until December 31st 2017. Disclaimer: I was sent the Fall-themed bundle for purposes of review. However, all thoughts and opinions are my own.